Meizu takes on OnePlus with new online shop that sells the MX3 smartphone "without invitation"
China’s Meizu today launched an international online shop that allows customers from almost anywhere in the world to buy its MX3 flagship smartphone. The white model is currently out of stock, but the black one is available in 16GB, 32GB and 64GB variants, for $399, $429, and $496, respectively. Free shipping and 12-month warranty are included. Meizu mentions that the MX3 can be yours “without invitation” - thus trying to poke fun at OnePlus, which is launching its CyanogenMod-based One smartphone via an invite system. To be frank, though, we’ll have to say that the features of the OnePlus One (which is newer and cheaper anyway) are superior to those of the MX3. Meizu’s handset offers a 5.1-inch display with an odd 1080 x 1800 pixels resolution, 8MP rear camera, Samsung’s Exynos 5 Octa 5410 processor, 2GB of RAM, and a 2,400 mAh battery. The device runs a custom FlymeOS, which is based on Android Jelly Bean - but it will be updated to KitKat starting this month. Later this year, Meizu should introduce the MX4, its next-generation flagship handset that reportedly features a 5.5-inch display with 1536 x 2560 pixels. Naturally, we’re expecting this to be sold via the new online shop, too. By the way, the shop is called Meizumart, and is accessible at the source link below. Not only are the specs off, the 64GB variant is $150 more. So pretty much fail. It seems everyone is aware of the epic OnePlus marketing failure. I feel bad for the OnePlus designers and engineers who obviously worked very hard, only to be betrayed by the gimmicks and stupidity of the OnePlus marketing team. Kudos to Meizu for doing things better and thinking of customers first. I'm sure Meizu's phones will get better and unlike OnePlus, people will actually be able to buy them. I don't think it's that. I just don't think they can make enough to meet initial demand. I can see the 64gig version selling all year long if it was available. When a company can't meet demand, usually the put in place a pre-order system, so you can pay and then get a phone when manufacturing catches up. It works and people are used to it. OnePlus put in a place some sort of social networking hunger games to win an invite instead of pre-orders. Had people smashing phones which beyond being wasteful is also potentially harmful if a battery explodes. And this was after months and months of hype. All that hype and no phones unless you want to play games. I am going to get the OnePlus 64GB phone for $350, no doubt about it. But I would have been much happier with a pre-order system than OnePlus marketing gimmicks. If Vivo puts Cyanogen on their new Xshot phone, I'll also get one of those. These top spec, good value, Chinese phones open the world of good Android phones back up to people who don't want to or can't afford to spend $650-700+ on a 16GB phone (i.e. Samsung, HTC, etc.) often with some sub-par specs (4MP camera for example). Well let's see, I can wait a little less than a month and pay $350 for a 64gb phone. Or buy a phone with the same amount of storage, a smaller, lower resolution display, (not to mention the aspect ratio, 5:3???? Are you kidding me? ), lower resolution camera, smaller battery, more dated processor, less RAM, and what looks like a heavil y skinned version of android. All for an extra $146? I think I'd wait this one out. General availability is late May early June. I don't care with those all strangeness. The spec with cheap price is killing me. I would never go out of my way to buy a Chinese product. In fact, I go out of my way NOT to buy Chinese products. They have no respect for anyone else's right to property as they rip off everything and repackage it as their own, and they generally have the worst quality products in the world. Worst quality products? Which phone do you have? All phones are made in China, including the iphone (only LG manufactures in Corea and the moto X is assembled in the US). So is the iphone a good quality product or not? "They have no respect for anyone else's right to property as they rip off everything and repackage it as their own..." You mean like Apple and Microsoft have done for decades? Buy a S4 or One or T with better specs and price now. oh guys,I have to tell you that MX3 sold ￥1799/1999/2399yuan in China,that's about $299,I bought a 32GB several days ago,but the whole white edition had sold out for two months. I sure like how market is changing. It's finally opening up where we can skip over carriers for a phone purchase and just use them as the dumb pipes they are. Over priced hardware will pass like a fad, in time. The One Plus One looks like a great phone if anyone can ever actually buty it. But the truth is the only people that will buy it are phone fans like the people here. Average customers will still go to the carrier store and buy what they can afford. So ultimately they will probably fail. 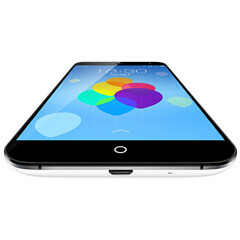 As for this Meizu deal nobody that really knows what is good hardware now will want this.